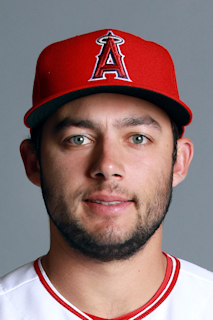 Draft: 2015, Los Angeles Angels, 6th rd. David Owen Fletcher...Originally signed by Angels' scout Ben Diggins... Teammates with Taylor Ward on Scottsdale Scorpions during 2016 Arizona Fall League... Ranked on Angels Top-10 prospect list for 2016 by Baseball America (#9)... Played collegiately at Loyola Marymount University (CA) from 2014-15...Majored in psychology...Garnered first team All-WCC honors as freshman and sophomore...Earned Freshman All-American accolades from Baseball America, Collegiate Baseball and the National Collegiate Baseball Writer's Association...Claimed WCC Defensive Player of the Year, first team All-WCC and WCC All-Freshman team honors in first season...2015 LMU Male Athlete of the Year... 2013 graduate of Cypress High School (CA)...All-State and All-CIF his junior and senior seasons, including CIF Player of the Year as a senior...2013 Empire League Player of the Year...Team captain and led team to the 2013 CIF Championship at Dodger Stadium...Hit .437 with 38 runs scored and 23 stolen bases... Spent 2013 summer playing in the Alaska League where he was a Gold Glove winner and named best professional prospect. After beginning the year with Triple-A Salt Lake, made Major League debut with the Angels June 13th vs. Seattle (3/4, 3B, 2 RBI)... From debut to his final game of season on Sept. 16th, ranked in the Top 5 by A.L. rookies in several categories including, average (.275, 3rd), hits (78, 2nd), doubles (18, 3rd), runs (35, T4th) and OBP (.316, 4th)... Left game Sept. 16th in the 1st inning with a left hamstring strain... Defensively, appeared in 43 games at second base, 33 at third base, seven at shortstop and four in right field... In 58 games in Triple-A, hit .350 (89/254) with 25 doubles, five triples, six home runs, 35 RBI and 55 runs scored...Was leading PCL in hits, doubles, extra-base hits and runs at the time of promotion. 2017 marked third professional campaign with Angels...Split season between Double-A Mobile and Triple-A Salt Lake...Combined to hit .266 (119/448) with 59 runs, 20 doubles, two triples, three HR, 39 RBI and 20 stolen bases on 111 games...Committed just four errors in 454 total chances at 2B & SS between the two clubs (.991 fielding pct. )...Named Angels Organizational Defensive Player of the Month for May & June ... Posted 33 multi-hit games in 2017, including nine three-hit efforts and a four-hit game...His 20 stolen bases established a career best. Spent majority of 2016 season with Single-A Inland Empire...On Temporarily Inactive List (wrist injury) May 2-June 11...Had a 22-game hitting streak (July 6-29), best in the Angels farm system for 2016 ... Promoted to Double-A Arkansas Aug. 16, 2016 and hit .300 (24/80) in 20 games with Travs...Committed just six errors in 422 total chances at 2B & SS (.986 pct.) ... Teammates with LAA prospect C Taylor Ward on Scott sdale Scorpions during 2016 Arizona Fall League ... Ranked on Angels Top-10 prospect list for 2016 by Baseball America (#9). In first professional season in 2015, hit .331 with a .391 on-base percentage in 37 games for short-season Class-A Orem...Promoted to Single-A Burlington and hit .283 with a .358 OBP in 32 contests...Stole 17 of 22 bases in 2015. 12 de junio de 2018 Los Angeles Angels seleccionado el contrato de 3B David Fletcher de Salt Lake Bees. 6 de febrero de 2018 Los Angeles Angels invitado fuera del roster SS David Fletcher para spring training. 15 de julio de 2017 SS David Fletcher asignado a Salt Lake Bees de Mobile BayBears. 8 de mayo de 2017 Mobile BayBears activan a SS David Fletcher de la 7-d&iacute;a lista de deshabilitado. 11 de abril de 2017 Mobile BayBears ponen a SS David Fletcher on the 7-d&iacute;a lista de deshabilitado. 2 de febrero de 2017 Los Angeles Angels invitado fuera del roster SS David Fletcher para spring training. 16 de agosto de 2016 David Fletcher asignado a Arkansas Travelers de Inland Empire 66ers. 11 de junio de 2016 Inland Empire 66ers activan a SS David Fletcher de la lista temporalmente inactiva. 2 de mayo de 2016 Inland Empire 66ers ponen a SS David Fletcher en la lista de inactivos temporalmente. 6 de abril de 2016 SS David Fletcher asignado a Inland Empire 66ers de Salt Lake Bees. 22 de marzo de 2016 SS David Fletcher asignado a Salt Lake Bees de Orem Owlz. 7 de marzo de 2016 SS David Fletcher asignado a Los Angeles Angels. 5 de septiembre de 2015 SS David Fletcher asignado a Orem Owlz de Burlington Bees. 28 de julio de 2015 SS David Fletcher asignado a Burlington Bees de Orem Owlz. 16 de junio de 2015 SS David Fletcher asignado a Orem Owlz. 14 de junio de 2015 Los Angeles Angels firmado SS David Fletcher.